I have chosen Mookie Blaylock as the 10th best point guard of the 90s, mostly, because of his unselfishness and his ability to defend. He has been selected at number 12 of the 1989 NBA Draft from the New Jersey Nets. He played for the Nets from 1989 to 1992 and then he was traded to the Atlanta Hawks where he played from the 1992-93 season to the 1998-99 season. He has been named at the NBA All-Defensive Team two times (1993-94, 1994-95) and four times (1995-96, 1996-97, 1997-98 and 1998-99) at the NBA All-Defensive Second Team. He was selected as reserve for eastern squad at the 1994 NBA All Star Game and he led the NBA in Steals per game for two consecutive seasons (1996-97, 1997-98). He was also a great rebounder, considering that he was only 6-1. Mookie Blaylock was the starting point guard of Atlanta Hawks during their two best seasons, during the 90s (1993-94 and 1996-97), where they recorder 57-25 and 56-26 respectively but eliminated at the Eastern Conference Semi-Finals, both of the times. Blaylock was not a fancy player, I don’t remember any of us, young kids back then, picking Blaylock as our favourite player. He was a guy that was doing his job night in night out. But when I started thinking of making a list with the top players of my basketball era, as I like to call the 90s, Mookie’s name was one of the first that came to my mind. It was a difficult dessicion and I gave it a lot of thought before I decide to rank him at number 10. Initialy I thought of him as number 8, however I believe that he deserves to be considered as one of the top ten point guards and that is what it counts. One more thing that I would like to say about Mookie is about a crazy story involving Mookie’s Blaylock name and this is of course (for those of you that are aware of the story) the original name of the Pearl Jam rock band. Guess what? 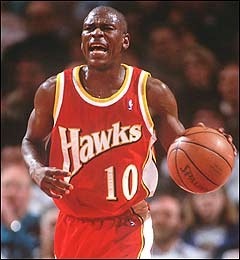 Their original name was Mookie Blaylock paying tribute to Mookie himself. They were finally forced to change the name but they named one of their albums ‘Ten” from Blaylock’s jersey number.